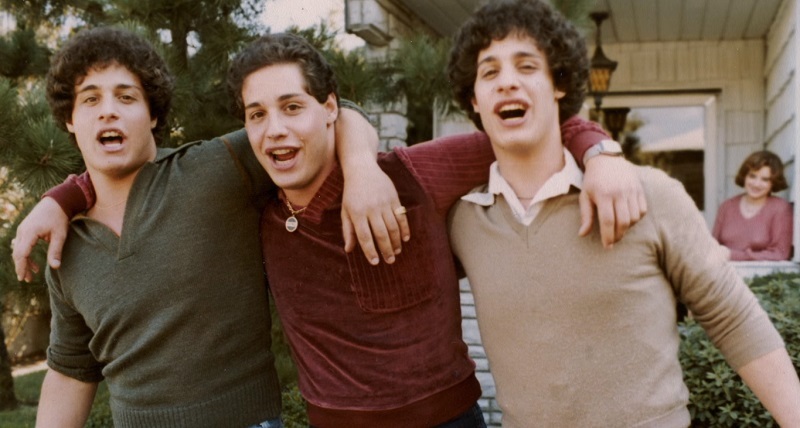 Its a story of 3 identical twin brothers, separated at birth, who never knew they had twin siblings, and only discovered this in their early 20's. 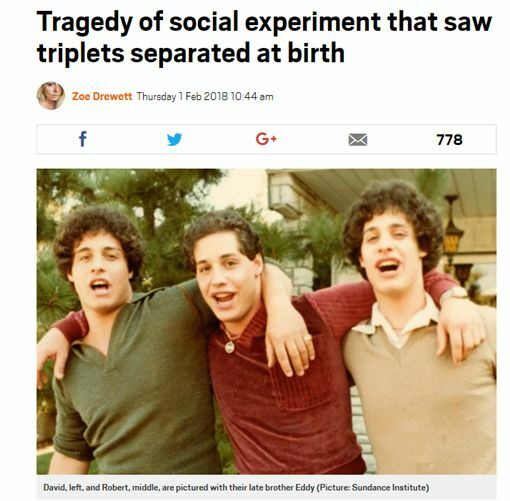 They later found out that they were part of an EXPERIMENT, which DELIBERATELY separated many sets of identical twins at birth, then followed and studied them as they grew up. The adopted parents participated, but were only told that they were part of a study about adopted children, and were given no info that it was about identical twins. Thus they allowed the scientists to come and interview, test, and film the kids from birth regularly their whole lives, collecting and comparing data. The leader of the study is now dead, and all the research was classified and locked away in the archives of Yale University. Upon release of this film they opened the files but they were heavily redacted and did not reveal much, other than that it was done with MANY sets of twins, and not just these 3. The study was funded by some super-high profile Jewish group via Yale University called the 'Jewish Board of Family and Children's Services', with connections in the highest places of Yale and Washington DC. One of the research assistants in the film boasts of her many photos with people such as Barack Obama, Al Gore, etc. They were working in partnership with a specific adoption center for Jewish children/families called 'Louise Wise Services', who cooperated in separating the children and covering up the details of the experiment. This org is now shut down. There was also a strange detail in that all the children being studied were put into specific homes, each with an older female non-blood sister. Another anomaly that was not proven to be part of the experiment but suspected is that many of the mothers of the separated twins suffered from mental illness. All of the twins of the film for example spent time in mental institutions in their teens. 1. Nature vs Nurture; how similar or different would they turn out to be? 3. Whether or not mental illness is genetic/hereditary. One of the twins committed suicide. Crazy story. Bizarre experiment. I wonder what it was really all about. The main concern was probably nature vs nurture, but whats with the older sister thing? It seems they were trying to isolate certain variables and how they affect development. So they were likely part of a cloning program?